Discover Carven's L'Eau Intense Eau de Toilette; a distinctive, woody fragrance for the contemporary man. Housed in a glass bottle dressed in white lacquer with a masculine silhouette and squared shoulders, the EDT combines fresh mint, sparkling grapefruit and Italian lemon, layered over aromatic lavender, birch leaves and warming ginger. 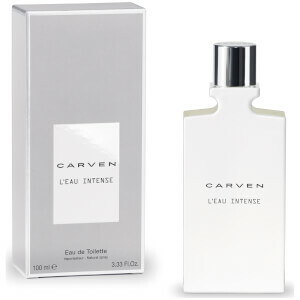 Finishes with a captivating base of cardamom, cedarwood and amber. Top Notes: Mint, Grapefruit, Italian Lemon. Heart Notes: Lavender, Birch Leaves, Ginger. Base Notes: Cardamom, Amber, Cedarwood.